Last month aspiring barbers competed in Salon Success Academy’s first ever Barber Battle. What exactly is a Barber Battle you ask? Students vie in several different categories against one another other for fun and prizes. The goal of the friendly competition was for students to gain confidence in their craft, while getting boatloads of hands-on experience. It was also a great opportunity for the soon-to-be barbers to network with local shop owners and receive some expert advice. The competition was judged by Upland barbershop owners. Gross said in the future he’d like to expand the Barbershop Battle so Salon Success Academy campuses compete against one another—specifically, Upland vs Riverside. What made the battle so rewarding was that the judges really interacted with the students. If something was great they let them know. If something could have been done better, they helped students address the issue and learn the steps to fix it. Once the competition was over students and judges had the opportunity to chat and exchange business cards. The judges also offered student tips and tricks of the profession. At Salon Success Academy, we teach you all you need to know about a career in Barbering—and more. Practice what you learn on actual clients find out insider tips on how to run the business side of barbering. We also help you prepare for the exam that will license you to practice your craft in the State of California. If you’ve always dreamed of becoming a barber, what are you waiting for? Learn the basics of hair anatomy and physiology, and proper sanitation procedures for salons and barber shops. Get hands-on instruction on the latest hair cutting, coloring, and grooming technique. And learn from instructors who are your biggest advocates. Our team of professionals will help prepare you for the State Board exam and teach you how to make the most out of your career by providing excellent customer service after you have passed the exam. Want to participate in our next Barber Battle? 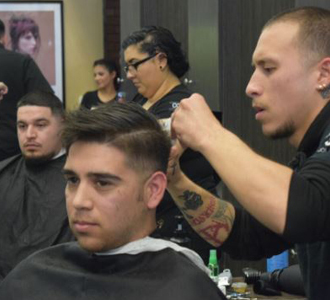 Enroll now for our Barbering Program, offered at both our Riverside and Upland campuses. Fill out the form to request more info or give us a call now at: 1-877-987-4247.